Laminate flooring is a material designed to resemble solid hardwood flooring, but costs just a fraction of the price. It is made from a resin and wood-dust base covered with a paper top layer. The paper is printed to look like real wood, then topped with a protective coat. 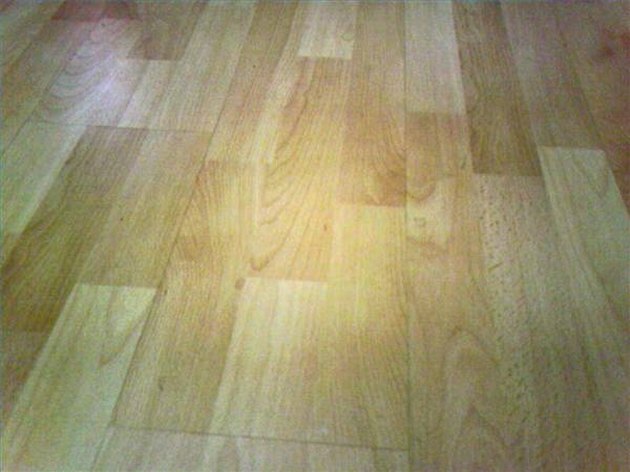 Laminate floors may be glued down or installed as floating systems, which lock together using tongue-and-groove connectors. Because laminate is typically thinner and less sturdy than real wood, it is critical that you properly level the subfloor before you install laminate. Nail down loose floor boards or plywood. As floors are exposed to foot traffic and general wear and tear, the nails can become loose. This often gives the floor an uneven appearance, especially where several loose sections meet along a joint. Add flooring nails as necessary to secure the subfloor, and countersink any fasteners that are not flush with the surface. Sand away high spots using a belt sander or flooring edger. Each of these tools can be rented at most home improvement stores, and can help to make your wood subfloor level. Work slowly, and check the floor with a level as you work. Carefully vacuum all sanding dust and debris before proceeding with installation. Fill cracks or major voids with wood putty or a self-leveling compound. Use a mixture designed for wood subfloors. Mix the compound as directed on the package, then pour it onto the low spots in the floor. Use a trowel to spread the material, then allow it to dry before proceeding. Add a layer of plywood. If your floor is fairly level, but not very flat, a layer of plywood can even it out enough for successful laminate installation. Plywood should be nailed in place, and sheets should not overlap. Grind away high spots using a concrete grinder. This tool should also be used to remove dried drywall compound, paint or other materials affecting the levelness or flatness of your subfloor. These machines can be rented at most home improvement stores. Fill small holes and cracks with latex cement. This product comes in a tube, and is applied with a caulk gun. Fill cracks or voids completely, then wipe away excess material. Level low spots or major voids using a self-leveling compound or concrete patching mixture. Either of these products can be purchased at home improvement or hardware stores, and should be mixed with water in ratios indicated on the package. Use a trowel to apply these compounds to the floor, then spread them evenly and allow them to dry. Cover the surface with a layer of plywood. This works well in instances where the concrete is fairly level, but is marked by a large number of small cracks or signs of spalling. Use masonry nails to secure the plywood sheets in place.